Houston Street Hyacinthaceae . . .
New Yorkers know a tourist when they overhear someone pronounce “Houston Street” in the same way as the first city of Texas. Houston is a major East-to-West artery that connects Greenwich Village with the East Village and has also, in part, given the SoHo district its famous moniker (which stands for “South of Houston”). The reason why the street is not pronounced with a Texas drawl can be traced to the real origin of the name – William Houstoun (pronounced “house-ton”), who was a Georgia delegate to both the Continental Congress and Constitutional Convention. 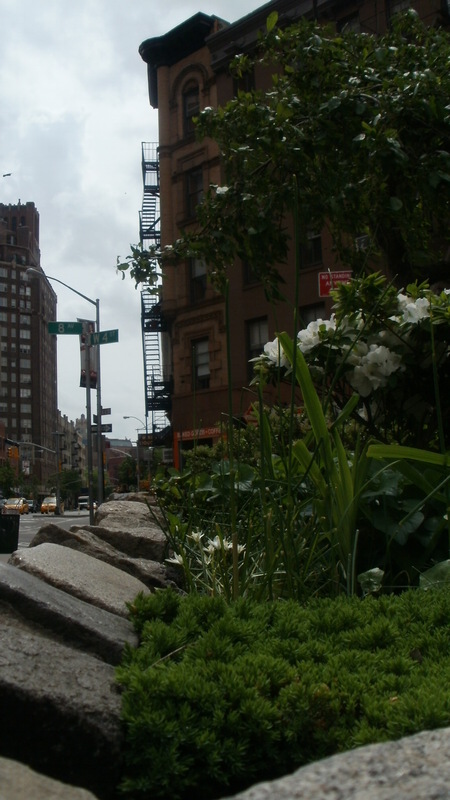 Another interesting fact, this one regarding the thoroughfare’s natural history, is that Houston Street roughly corresponds to a former marshland that was drained by the Minetta Brook, a Manhattan trout stream that here once flowed west to the Hudson River. The area’s wet past returned during the final week of April, which was filled with sustained showers. Tree trunks began to sport fresh blooms of the common greenshield lichen, as reported in my last post. 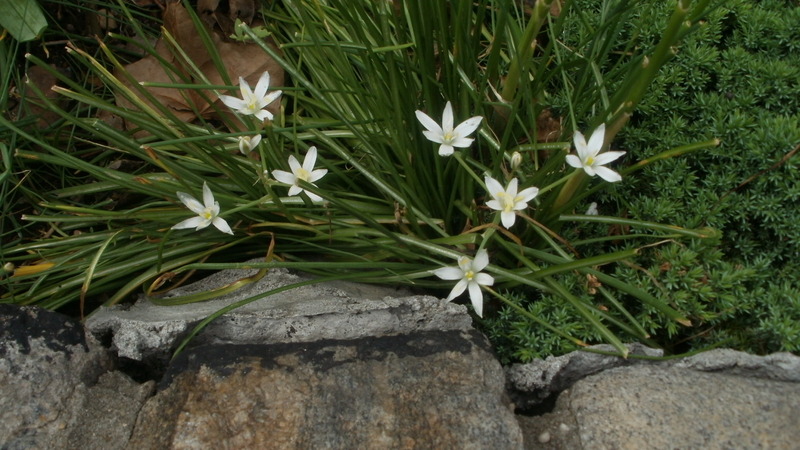 The damp soils also brought forth, at least along Houston Street, one of the other April wildflowers that are often found along shaded lawn edges and trout streams: The Star-of-Bethlehem, also known as the Grass Lily (Ornithogalum umbellatum). 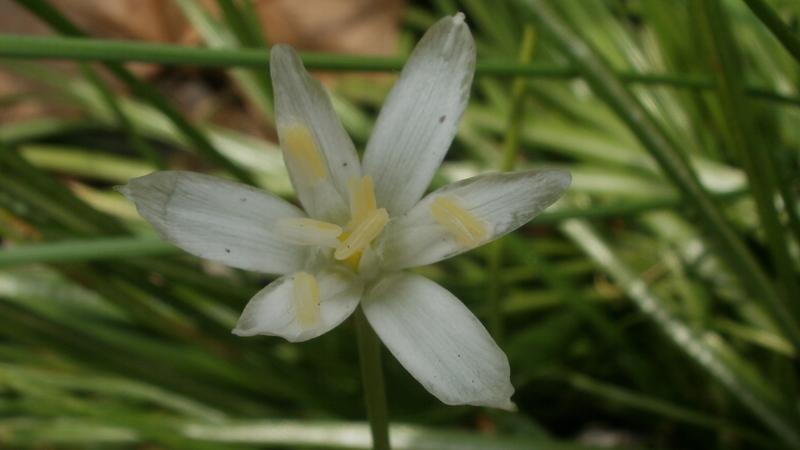 The grass lily, a perennial immigrant from Europe, is actually a member of the Hyacinthaceae family. The plant’s blooms grow in a branched cluster called a raceme, which is supported by fleshy stems that rise from a base of green blades. 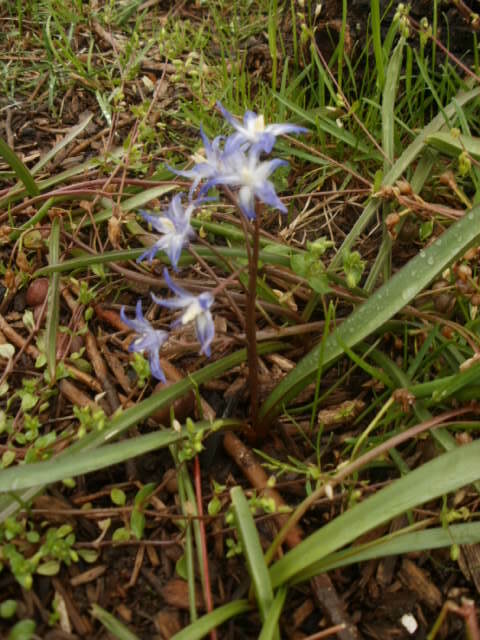 Spring wildflower seekers will notice the six narrow, pointed white petals resemble the bloom of its deep blue cousin, the Siberian squill (Scilla siberica), the flower that first inspired the creation of Wildflowers of the West Village. During a weekday walk around the Washington Square area, I passed through LaGuardia Place, the open area surrounding the bases of Silver Towers, a trio of beige concrete beehives designed by I. M. Pei. These buildings, elegantly spaced, are situated in an open greenway, the kind popular with the International Style of the 1960’s. Grass predominates here, with trees and flower borders placed along the black metal fencing. 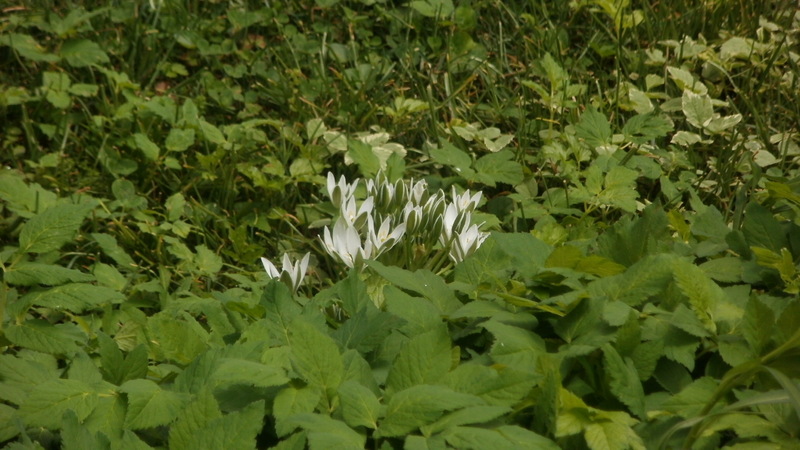 On the south side, facing the busy traffic of West Houston Street, I spied a small cluster of grass lilies, blooms facing up, held in a position that reminded me of hungry baby birds sitting in a nest. Farther up and to the east, near the base of the same fence, I found a few more plants rearing up wild amongst the formal domesticated plantings. The grass lily’s appearance is not unlike that of the dandelion on some greens, especially in suburban areas that adhere to the golf course school of lawn management, and so are thus often mowed down. These scattered examples were close enough to the edges to remain out of the spotlight long enough to bloom. Grass lilies in the West Village; a small yet pretty reminder of the brookside wetland environment that once flourished here before the city of New York was built. Grass lilies appeared almost as quickly as mushrooms just a few days after my first sighting and photo session along Houston Street. Patches of the white blooms popped up all over the south lawn of the Silver Towers as well as within the Jefferson Market Garden along the Avenue of the Americas. 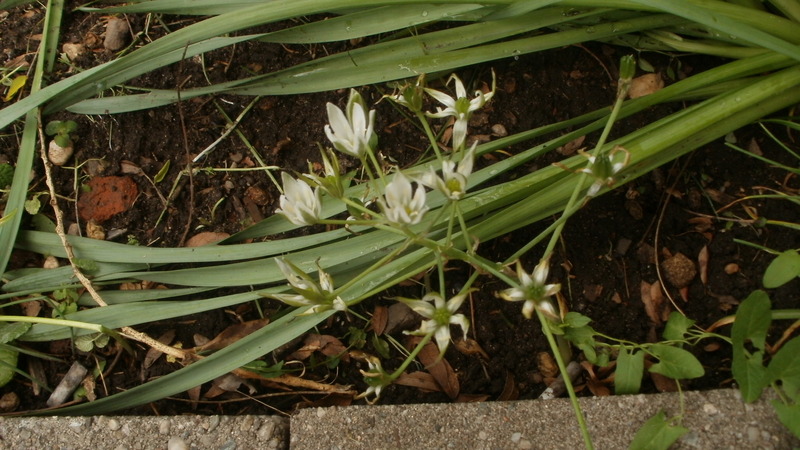 I was also surprised to see a few Star-of-Bethlehem shining in the Reggie Fitzgerald Triangle on W. 4th Street, the same little green space where I found onion grass to be growing in early April. Here are a few additional photos from that location, including a close-up portrait that displays the “star” portion of the plant’s other popular name.